The trip of a lifetime took a sour turn when a Swiss woman's bicycle was stolen in D.C.
Sandra Jaggi started a cross-country trip with her aunt in Los Angeles in April. After making it to D.C. in June, they decided to lock their bicycles on a bike rack at the Capitol Heights Metro station overnight. When Jaggi and her aunt went back to the Metro station, both of their Surly brand touring bikes were gone. "We're not used to [a place where] the bikes get stolen so easily. So, we just had a cable lock, which was quite, kind of, stupid," Jaggi told News4 via Skype. A couple of days after their bikes were stolen, they turned to the Silver Cycles bike shop in Silver Spring, Maryland, to help them get replacements, so they could finish the last leg of their trip from D.C. to New York. 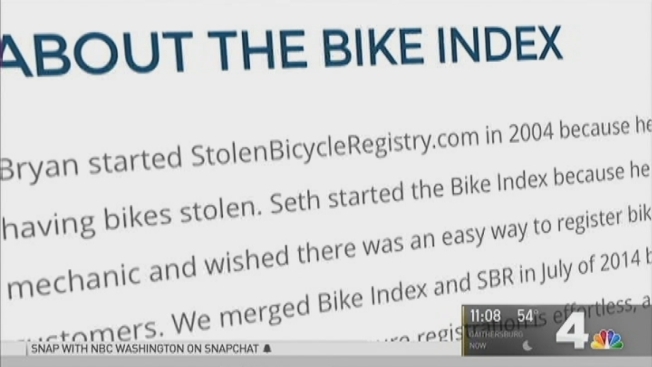 "I urged them to get a police report done and get the bikes registered on the online network, Bike Index, and on all the local D.C. groups ... to watch for this bicycle in the area," said Jen Trujillo, who works at Silver Cycles. On Oct. 6, Jeggi's bike turned up on a classifieds website. D.C. cyclist Chris Olin said he knew something was suspicious when he spotted the bike, worth $1,200, listed for $300. The seller on the website identified himself as "Jay." After Olin called police, Metro Transit police set up a sting. "So, our detectives researched a little further. Sure enough, we made contact with the individual who identified himself as Jay. Made a deal over the internet. Met him the following day and arrested him for the stolen bike," said Metro Transit police Chief Ron Pavlik. James Victor Cannaday, 27, of Brandywine, Maryland, was arrested and charged with receiving stolen property. He said he purchased the bike from someone else for $50. Silver Cycles has repaired the bike, and Trujillo said it will soon be shipped back to Jaggi in Switzerland. "Such a nice experience and we did not expect it, but it was amazing," Jeggi said. Her new friends in D.C. have promised to keep an eye out for her aunt's stolen bike, a khaki-colored Surly Long Haul Trucker.